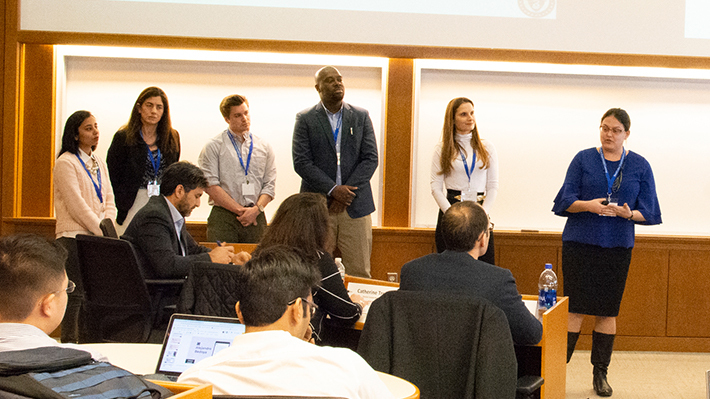 LeBow’s inaugural Marketing Crisis Challenge, delivered by the Dornsife Office for Experiential Learning, put a new spin on the standard business case competition. In the challenge, groups were presented with a business case by associate professor of marketing and Cozen Research Scholar in Marketing Daniel Korschun where they had to assess political risk and brand integrity in addressing a hot-button social issue: gun control versus gun rights. The hypothetical scenario: At Talen Energy Stadium, home to Major League Soccer’s Philadelphia Union, a fan tries to bring a loaded firearm into the stadium. Though he’s stopped from entering and arrested, stakeholders are looking to the organization to make a statement on the issue. Five groups, comprised of 27 students from the MBA, MS in Marketing and MS in Business Analytics programs, went to work on tackling this topic, with articles written by Korschun on corporate activism as a guide. Ultimately, a group of first-year MBA students won first prize: Garret Bullard, Amanda Myrkalo, Pooja Acharya, Ana Rita Bentes dos Santos, Marianna Tretiak and Alexander Opaluwa. Myrkalo, who came to the full-time MBA program with professional experience in marketing, helped to organize her group. “As MBA students, we looked at the overall business and really focused on the team,” she says. Ultimately, the winning group figured out a middle path: stating that guns are not allowed at the stadium without taking a broader stance on their role and presence in society. The panel of judges – Dan Keir, Executive Director, Consumer Marketing at Comcast; Brian Papson, Vice President of Marketing at the Philadelphia Eagles; Catherine Trefz, Director of Content Marketing at Ricoh USA, Inc.; and Jeff Haas, Director of Business Strategy at Seer Interactive – found their statement and presentation compelling. Other groups drew more heavily on data and analytics, but during team presentations, several of the judges warned against “analysis paralysis” or pulling together too many strands of data without connecting them to an overall theme. The Marketing Crisis Challenge is an opportunity to integrate industry through experiential learning, a staple of LeBow’s graduate programs. “These competitions are a big deal for us, both as a resume builder and for networking,” Myrkalo says. With her group’s win, she and her teammates took home prizes provided by Comcast and the Dornsife Office for Experiential Learning. The LeBow-led panel of business professors from 39 universities gave Lyft a “B” and Uber a “C+” for their reactions to Donald Trump’s executive order barring visitors and refugees from seven Muslim countries. Daniel Korschun, associate professor of marketing and Stephen Cozen Research Scholar in Marketing, received a Fulbright award to conduct research in Italy.